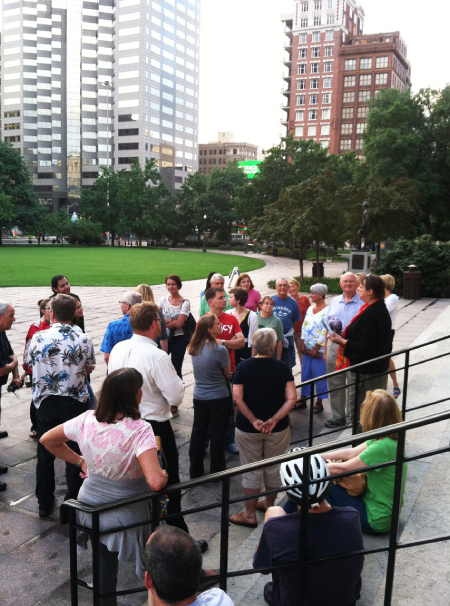 CityWalks Columbus Guided Tours begin at the corner of Broad & High Streets, Columbus’ most historic intersection. These walking tours cover the architecture and history of the area with fun and interesting stories shared by expert tour guides. Please check back for 2019 season information in May! – Tours are held on Saturdays from June through October at 10 a.m. and once monthly at 7:30 p.m.
Columbus downtown buildings range in style from Beaux Arts to Gothic, Modern to Greek Revival, Neo-Classical to Chicago School, and more. Woven throughout the monumental and symbolic government and bank buildings, and the tucked-away architectural gems, outstanding public art and parks are the stories of Columbus’ immigrant roots, natural disasters, and famous citizens. This tour is ideal for Columbus visitors and residents alike! Our entertaining tour guides are expets in history and architecture and look forward to walking with you! Tour route is approximately 1.5 miles. Tour is outside and focuses on building exteriors, but we may pop in to one or two sites along the way. Key tour features may include Huntington Bank Building, Wyandotte Building, LeVeque Tower, Palace Theatre, City Hall, Ohio Judicial Center, Riffe Center for Government & the Arts, Lazarus Building, Fifth Third Building, Ohio Theatre, Ohio Statehouse, Bricker & Eckler, Columbus Dispatch, Trinity Episcopal Church, Rhodes Tower, Pearl Alley, the Hayden Buildings, and 8 on the Square. Parking is available at metered spaces on Broad Street adjacent to the starting point or in the Statehouse Parking Garage and other area garages and lots. There is also a COGO Bike Share next to the starting point and the free COTA C-Bus stops nearby.